Not to give things away but they do, in fact, find him. 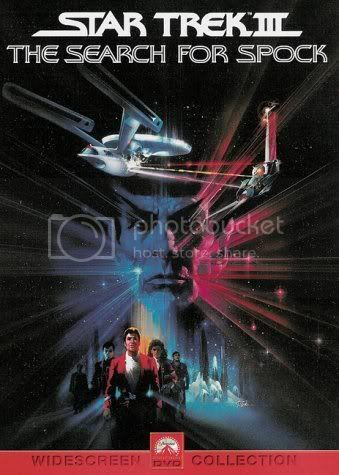 Unwilling to pay another $X to see the 2009 Star Trek again in cinemas, and in our quest to get over our deeply-ingrained anti-Trekkie prejudice, we have decided to delve into the home VHS pile. This is what we found. Disclaimer: Apart from the 2009 film, we've never seen any Star Trek. After seeing this, we can remember why we avoided it. Death to Trek, raaah! SPOCK: [to Kirk] I have been and always shall be your friend. McCOY: [to an unconscious Spock] I'm gonna tell you something that I... never thought I'd ever hear myself say. But it seems I've... missed you. And I don't know if I could stand to lose you again. KIRK: [to Spock's dad] If I hadn't tried [to save Spock's life], the cost would have been my soul. - gosh, well, we at the PPCC were positively aglow with good vibes! No wonder these people generated slash. Because The Search for Spock is ultimately about love. Predominantly male love. The love of fathers to sons, sons to fathers, and friends to friends. The love of a captain to his science officer. A doctor to his captain. Etcetera. We begin our masculine love journey with a tragedy: Spock (Leonard Nimoy) is dead. The spaceship Enterprise and its crew - Captain Kirk (William Shatner), Doctor Leonard "Bones" McCoy (DeForest Kelley), Engineer Scotty (James Doohan), Token Symbolically Post-Cold War Chekov (Walter Koenig), Token Multicultural Sulu (George Takei), and Token Post-Race (but not post-gender, apparently, as she does nothing!) Uhura (Nichelle Nichols) - have just docked into a massive way station for some calm-time. But McCoy's been acting weird ever since Spock died - like, really weird. Brainwashed weird. And it soon comes to pass that Spock, before his death, MIND-MELDED (our favorite thing ever!) with the good doctor and is using the latter's brain kinda like a jump drive. How would you like a taste... OF MY BRAIN?! What's Spock's first name, anyway? Spockfield? 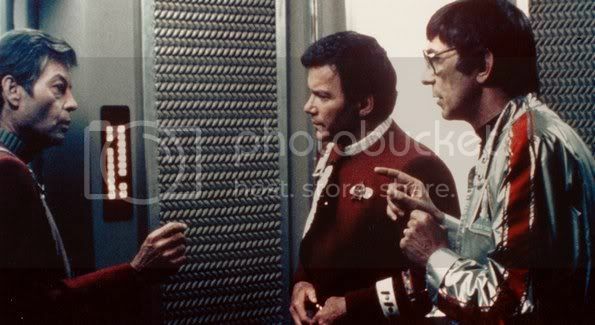 So what to do, before McCoy's brain just melts under the sheer weight of his Spockliness? Find Spock! They seek out his coffin on the planet of Genesis, the science project-gone-wrong of Kirk's well-meaning scientist son (?! ), David (Merritt Butrick). Everything on Genesis ages really rapidly and violently. It can even make cells regenerate. Spock's coffin was shot out into Genesis. Convenient! What's not so convenient: the arrival of a small band of angry Klingons on Genesis, led by a pissed-off Doctor Emmett Brown, Commander Kruge (Christopher "1.21 GIGAWATTS!?" Lloyd). Action-adventure ensues. Why is it whenever we need Star Trek caps, we find something totally bizarre? This was all very fun and a little demented and certainly gloriously space masala at times, but - gosh darned it - we just cannot take this stuff seriously. Maybe it's the Enterprise's carpeted hallways. Maybe it's those somewhat-too-tight pants everyone's wearing. The hokey faux Navy vibe? (Actually, we kinda dig that.) Whatever it is - despite Star Trek's excellent narrative structure, cunning and bizarre sci-fi ideas, and the great characterizations - we just cannot take it as anything more than funny and cute. Are we too old? Did we miss the boat? Taking a break from our usual film analytics, can we just say something else? McCoy! McCoy McCoy McCoy. A grumpy, mint julep-jonesing doctor who introduces himself by his phobia? All gruff and twitchy and cynical and yet a total softie inside? A guy who professes his love by using cosmological comparisons?! BE STILL, MY HEART! OH, TOO LATE - IT'S DEAD, JIM! Leonard has killed it. In fact, watching the episode Space Seed (intro to Khan) and then watching ST II is comfort food for my brain. I'm not a huge fan in any case of anything that came after (although I did love ST II, because of Khan and the original episode as Long Haired Spider says above) but the original series is not to be missed.